Oldcastle made sure that their name will be in the hat for next years Meath senior football championship draw with this one point win over Dunshaughlin in a relegation play off Simonstown. Robbie Farrelly and county player Paddy Gilsenan proved to be the heroes for the North Meath club each scoring four points. 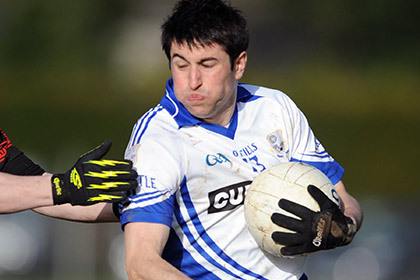 Gilsenan sealed Oldcastle's victory with a superb point in injury time. Best for the winners were Conor McHugh, Darren Hawdon, Cian McPartland, Robbie Packenham, Alan McCann, the Farrelly Terry and Ronan and Gilsenan. Oldcastle: C.Mc Hugh, D.Hawdon, C.McPartland, M.Cadden, R.Packenham,0-1, T.Farrelly0-1, A.McCann, S.Tierney, P.Rahill, Ronan Farrelly, 0-1, R.McHugh, E.Gilsenan(0-1, Robbie Farrelly 0-4, P.Gilsenan0-4, T.Rahill.